Three years from now, Philadelphians and tourists from near and far will walk into a Philadelphia Museum of Art that has undergone the largest expansion and restoration to date. Several areas of the museum, including the north entrance and lobby, forum, vaulted hallway and Lenfest Hall offered an exclusive few a dramatic reveal Thursday morning during the groundbreaking of architect Frank Gehry’s “Core Project” – a $525 million campaign to transform and restore parts of the museum long gone untouched. 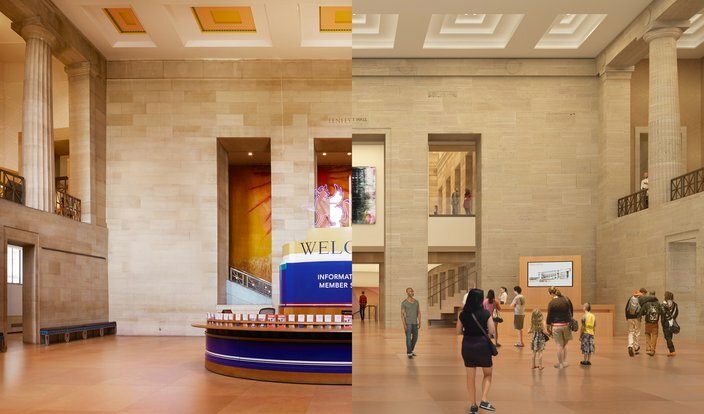 This is a before and after view of the South Lobby of the Philadelphia Museum of Art. 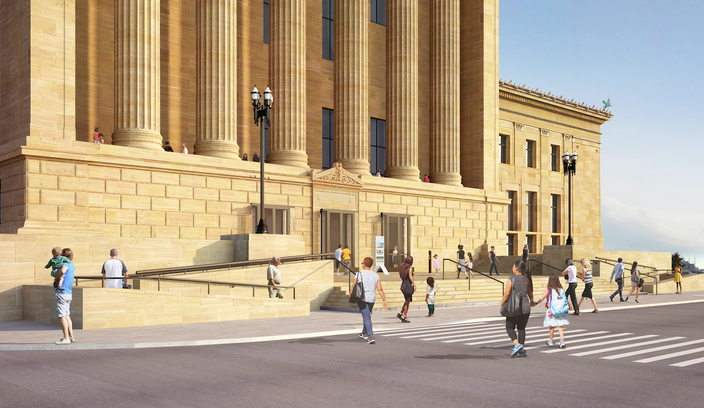 As key parts of the campaign, a significant amount of new public space within the footprint of the art museum will be added, as well as new gallery displays and areas for staff to explore new technologies, educational programming, and community outreach. “Today we stand here almost 90 years after it first opened up its doors, embarking on another bold vision, renovating this landmark building for the first time ever,” said Mayor Jim Kenney, flanked by a slew of donors, art museum board members and trustees, all wearing hard hats in the construction zone. The timetable for completion of the “Core Project” is 2020. Gehry, who hails from Toronto, Canada, was selected in 2006 to design the new Facilities Master Plan – a goal set by the museum staff and trustees – after identifying the need to improve aging infrastructure, add more space for a growing art collection, reorganize the building for present and future programmatic needs and enhance general visitor experience. He has successfully completed such notable projects as the Guggenheim Museum in Bilbao, Spain, the Walt Disney Concert Hall in Los Angeles, Calif., the Jay Pritzker pavilion and BP Bridge in Millennium Park in Chicago, Ill., as well as many others. These new ADA-compliant ramps update the west entrance with a modern aesthetic. “We spent a lot of time looking at the bones of the building,” Gehry told the crowd. 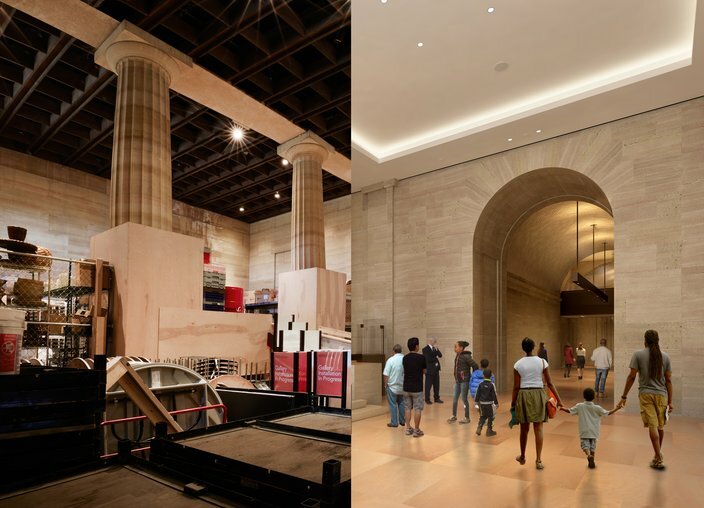 This is a before and after of Lenfest Hall at the Philadelphia Museum of Art. The “Core Project” will open up a total of 90,000 square feet of space to the public, which includes 23,000 square feet of new space, and once the Gehry plan is completed, the art galleries will have gained 55,000 square feet, for a total of 78,000 square feet of observation space. The museum will remain open to the public and fully operational during the three years of the construction period.